A part of Samsung's continued J series of smartphones, the newest edition of the Galaxy J1 is an entry-level smartphone that is pretty much along the same lines as previous years' model barring a few changes here and there. Apart from that, Samsung has also incorporated some software enhancements which are a part of the company's 'Make for India' initiative, such as the S Bike Mode and S Power Planning. The rest of the specifications of the Samsung Galaxy J1 4G (J120G) are pretty much the same as the last year's Galaxy J1, such as the same screen size (4.5-inch), RAM (1GB), in-built storage space (8GB), cameras (5MP rear and 2MP front) and OS (Android 5.1.1 Lollipop. It is also worth mentioning that Samsung has used a Super AMOLED display panel for J1. 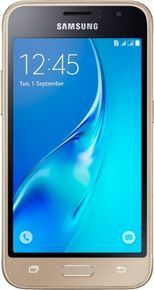 The phone is currently out in the market and the lowest price of the Samsung Galaxy J1 4G (J120G) is 6,890 INR. It is meant for people who want to buy tier-1 branded entry-grade handset from offline stores. 1 gb ram 8gb internal memory. Good display. Unwanted pre installed app no use at all. Less memory and ram for use.